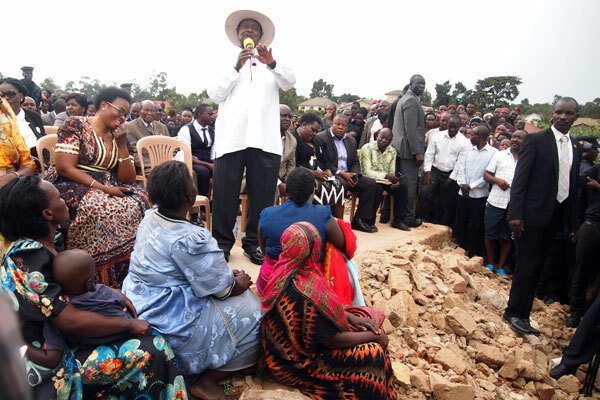 KAMPALA – About 1,000 residents of Rukiga district on Monday resolved to petition President Museveni, protesting the manner in which public land was sold to a Kampala-based businessman. According to a petition delivered through their Member of Parliament, Mr Herbert Kabafunzaki, the 2-acre public land located in Rushebya Trading Centre was auctioned after Rwamucucu Sub-county lost a criminal trespass case. On September 21, 2017, Kabale High Court ordered that the land in question be auctioned to recover costs in a case criminal trespass in which Mr David Gakyaro and Yosam Byandusya defeated Rwamucucu Sub-county. On October 18, 2017, the land was sold to Mr Adroni Alfred of Metro House in Kampala at a cost of UGX20 million. Attempts by the sub-county authorities to appeal have since borne no fruit after Kabale High Court judge Moses Kazibwe Kawumi last month dismissed the case with costs. But on Monday, during a meeting held at the sub-county headquarters, the local leaders led by sub-county chairman, Mr Deus Behangana, said they cannot lose land which has been acting as a playground that was hosting co-curricular activities, especially football competitions for schools in Rukiga county for over 70 years. Mr Behangana also said that the sold land has been hosting a weekly Monday local market where the district has been collecting local revenue to supplement development. “We present to you our petition to President Museveni for his urgent intervention and possible reverse of the sell of the district land because it has been the only central venue for hosting public functions that include political rallies and social gatherings.” Mr Behanhana said. Local residents that Mr Fred Kubiribe and Mr Alex Bagyenda said that the sold land has been also been used as a community grazing land for people around the area since 1940s. The Rukiga county Member of Parliament Mr Herbert Kabafunzaki faulted the courts of law for the decision to attach the district land in a case that was against the sub-county. “I am ready to take your petition to President Museveni as requested and I will make sure that I bring feedback to you. I request you to be calm and avoid acts of injustice and you wait for communication from the president,” Mr Kabafunzaki said.